“Hush ma bouchal, hush and listen”, And his cheeks were all a-glow. For the pikes must be together At the risin’ of the moon”. For the pikes must be together at the risin’ of the moon. “In the ould spot by the river, Right well known to you and me. With your pike upon your shoulder, By the risin’ of the moon”. With your pike upon your shoulder, by the risin’ of the moon. Many a manly chest was throbbing For the blessed warning light. And a thousand blades were flashing At the risin’ of the moon. Far above the shining weapons Hung their own beloved green. And hurrah, my boys, for freedom! ‘T is the risin’ of the moon”. And hurrah my boys for freedom! ‘t is the risin’ of the moon. (Oh! what glorious pride and sorrow Fill the name of Ninety-Eight). Who would follow in their footsteps, At the risin’ of the moon! Who would follow in their footsteps, at the risin’ of the moon. Oh! then tell me, Shawn O'Ferrall, Tell me why you hurry so? 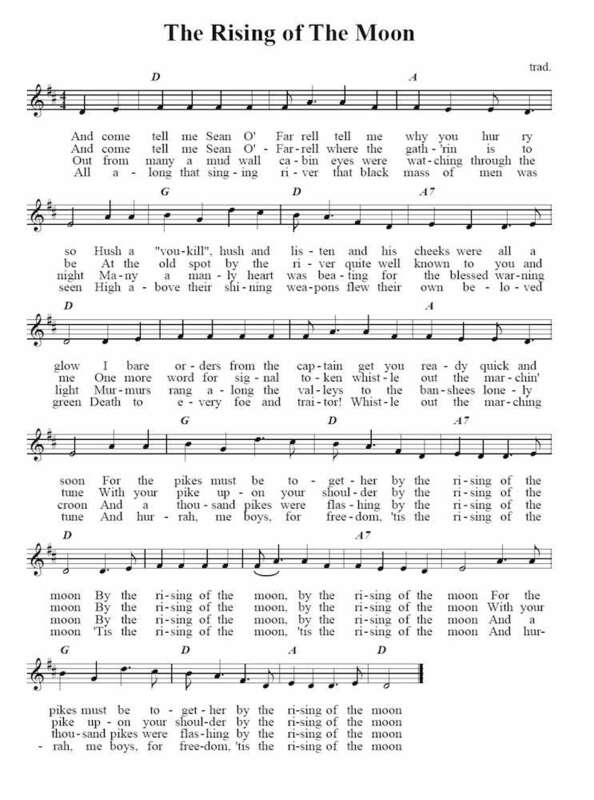 The ballad’s singer is told that the “pikes must be together at the rising of the moon” to engage in rebellion. The pikemen gather, but are defeated. Despite the loss, the listener is told that there are those will “follow in their footsteps” to again revolt. The lyrics were written by John Keegan Casey (1846-70), the “Fenian Poet”. The ballad has been in circulation since circa 1865. The earliest verifiable date found in publication is 1867. The ballad refers to the outbreak of the 1798 rebellion, as United Irish rebels convey the order to rise. The air of hope and optimism associated with the ultimately doomed rebellion was intended to provide inspiration for rebels preparing to take to the field in another ill-fated venture, the Fenian rebellion of 1867. Multiple variants of the lyrics have been published in folk music collections. Often sung by The Clancy Brothers and Tommy Makem among others, the song remains popular and the tune widely recognized in Ireland today, as it is often taught in schools, played regularly at official and sporting events, and has been covered by a wide variety of musicians. In the late 19th century, the ballad was also published through the printing of broadsides. The ballad takes the tune of another Irish ballad, “The Wearing of the Green” and was first published in Casey’s 1866 collection of poems and songs A Wreath of Shamrocks.